We sell Nature's Greatest Secrets products like Nature's Greatest Secret 20 ppm Colloidal Silver Spray - 100ml online in the UK and directly from our award-winning store in Scotland. A crystal clear, high quality solution which is 95% ionic and 5% colloidal with a high pH of 9.0. Large spray - 50 sprays approximately 5mls. 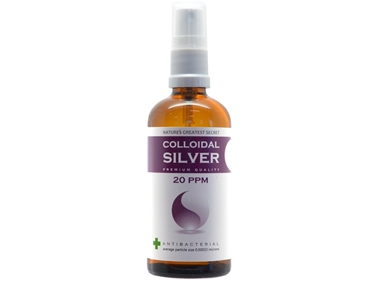 Where can you buy real 20 ppm Colloidal Silver safely online? If you are wondering where you can buy Nature's Greatest Secret 20 ppm Colloidal Silver Spray - 100ml safely online in the UK, then shop with us. 20 ppm Colloidal Silver - Nature's Greatest Secret 20 ppm Colloidal Silver Spray - 100ml in Colloidal Silver and Herbal Remedies, Tinctures & Supplements.